Crossing Science Road is the official War Memorial to University personnel who died between September 1939 and September 1945. It was finally built over the East end of Science Road in 1958 and a passage to the right gives access to the Main Quadrangle. This was the work of Wilkinson and Henry Ingham Ashworth, the new professor of Architectural Design. Ashworth is better known for his role in the selecting Joern Utzon’s design for the Sydney Opera House. . The arch, constructed of sandstone and re-enforced concrete, is significant as visual element in two precincts (Science Road and the Main Precinct) with a different architectural style on either side. It houses one of the University’s public art galleries, which, however, isn’t often open. 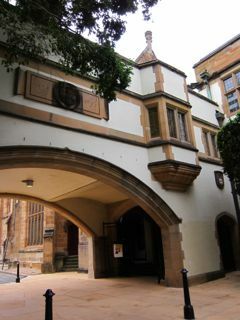 Such a bridge from the north side of the Main Quadrangle to connect with, and screen, the east end of the Macleay Museum had been proposed by architects from as early as 1890 and was repeated by Leslie Wilkinson in his 1920 Master Plan. 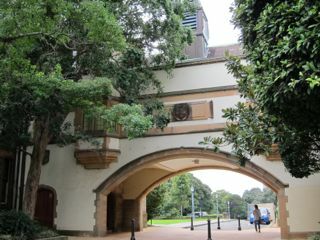 Wilkinson’s original scheme (to provide a link from the Main Quadrangle to a new entrance on the Parramatta Road) was substantially modified by 1924 when he designed the Botany addition to the Macleay Museum.